School is starting and Cabrini Connections, like all other volunteer based tutor/mentor programs, is seeking volunteers, and donors. While we're looking for people who will spend one evening a week as a one-on-one tutor/mentor, we're also looking for people who will use their talent to help us. If you email this to friends, co-workers, family and alumni, in Chicago, and in other cities, some will support us with time, talent and/or dollars and we'll be able to continue to offer this service for another year. At the end of the video is a link to the Tutor/Mentor Connection web site. If you search for tutor/mentor programs using the Program Locator or find a program section, you'll be able to find places throughout Chicago where you can use your time, talent or dollars to help kids. We don't make the world better by talking about its problems. We make it better by contributing to its solutions. Here is an ad that was created for me by some volunteers several years ago. 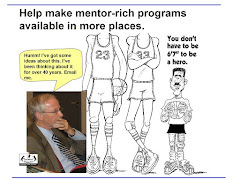 I use it and two other cartoon images because it illustrates how someone can help a youth, as a mentor, tutor, friend, or by using their talent to help a tutor/mentor programs connect additional tutors and mentors. This is a different version. It also points to the Tutor/Mentor Connection's web site where people can find information on how to start a program, or where they might volunteer, or enroll a child. However, this is one that a business can put on its web site, or in local media or a trade magazine. Just put your logo in the middle of the ad, and you're showing your support for tutoring/mentoring. If hundreds of businesses do this over the next few weeks, thousands of volunteers will become part of tutor/mentor programs in Chicago and in other cities around the country. I encourage you to visit the http://www.district299.com/ blog and read the articles posted on August 17 titled, "Youth Violence & CPS-- A View From Afar"
Links in this article go to newspaper articles in Australia that reflect on the violence in Chicago. This is how the rest of the world sees us. My vision is that the rest of the world would look at places like http://www.cabriniconnections.net where adults from the Chicago region are connecting with inner city teens in structured, non-school tutoring, mentoring, learning and enrichment programs. 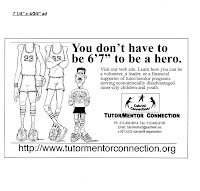 In the Chicago Program Links section of the Tutor/Mentor Connection web site you can find links to many other tutor/mentor programs who also connect youth and adult volunteers. In many of these programs there are a wealth of stories about kids who have changed the direction of their lives because of the involvement of a caring adult. Such involvement is not consistently possible if there are no structured programs (meaning rent, utilities, staff, technology, etc. and a long-term vision of helping kids stay in school and move to college and careers) . Here's a presentation that illustrates this structure. Most CPS education strategies don't focus much attention, or many resources, on making tutor/mentor programs available in every poverty neighborhood. However, that's the mission of the Tutor/Mentor Connection. All of the tutor/mentor programs in the Chicago region, and in other cities, are now looking for new volunteers, and donors, to launch the 2007-08 school year. You can help them find these roles if you take on the role described in this Collaboration Strategies presentation. We can change what is written about us by changing what we're all doing to help inner city kids. Average CPS freshman: 19 absences, 2.6 F's - Wake Up Chicago! The SunTimes article stated that "the AVERAGE for all 2004-05 freshmen in Chicago Public Schools was 19 absences and 2.6 F's." At one school the average was 44 days missed! The report ties early failure with later dropout rates. The authors of this report "examine how school practices affect students’ grades, failure rates and attendance. Students' grades and attendance are particularly better than expected in schools characterized by two features—supportive relationships between teachers and students, and a perception among students that the work they are doing in high school is preparing them for the future." What scares me is that the responses to this are band-aids, like confining students to one floor of a school, or creating later start times. No one is talking about systemic change of reaching these students as early as first grade with mentoring, social and emotional learning, arts and enrichment activities intended to build student aspirations and motivations so that when they get to high school they are more prepared to learn. There are people who are writing about learning styles. Click here, here, and here for a few examples. These are just a few of the resources on the Tutor/Mentor Connection web site that adults can learn from so that the strategies for building student aspirations engage more community stakeholders, start earlier, last longer, and reach the kids who are most disadvantaged because of high poverty surrounding them and their community. Until writers, community and business leaders, parents and non profits begin to form study groups, and build their own learning habits, too few people will ever read the research and policy as well as philanthropy and community service decisions will be based on sound bytes, not sound strategy. I outlined a learning strategy in a blog titled ENOUGH IS ENOUGH. I show how tutoring/mentoring is a way to engage adults in this learning, in this animated presentation found on the home page of http://www.tutormentorexchange.net. This maps shows a 12 mile radius around the Olympia Fields Country Club in the Southeast part of the Chicago region. It indicates areas of poverty concentrations from 5 to 40%, and shows locations of poorly performing public schools in Illinois (we don't have this info for NW Indiana yet). If you search the Tutor/Mentor Links Library or Tutor/Mentor Chicago Program Locator, you won't find many volunteer-based tutor/mentor programs in the area this map highlights. This either means we don't know about them, or they don't exist. If there are programs that are not in our database, you can email tutormentor2@earthlink.net and we'll show you how to add a program. As school is starting over the next few weeks, being listed will help you attract volunteers and will help parents, teachers and social workers find programs where they can enroll kids. We also hope that business and philanthropy leaders will use this information to develop funding strategies that support multiple programs throughout this regions. If there are only a few programs, and we think this is the case, we invite you to gather in November for the next Tutor/Mentor Leadership and Networking Conference, where you can meet leaders of programs, network with others who are trying to start programs, and connect your business and church volunteer strategy with a strategy that helps build more and better tutor/mentor programs in this region. Research shows that connecting youth in long-term mentor relationships with caring adults can make a difference, however, without places where kids and volunteers can meet, and resources to support this process, too many kids will grow up without this type of support. You can make a difference. Get involved. Get your company, fraternity, college, hospital or law firm involved. Yesterday was one of the special days of the year for me. I attended the 4th Annual My Hero Award Luncheon, hosted by The Sun-Times Judge Marovitz Lend A Hand Program of the Chicago Bar Association. More than 200 high profile lawyers, judges and leaders of volunteer-based tutor/mentor programs gathered to recognize the involvement of individual attorneys and judges, as well as the involvement of law firms and law associations in tutoring/mentoring programs operating throughout the Chicago region. The event honors the memory and example of Judge Abraham Lincoln Marovitz, who inspired the creation of the Lend A Hand Program in 1993, and who enabled it to grow with a generous gift from his estate when he died in 2002. The keynote speaker, Joseph A Morris, President of the Lincoln Legal Foundation told stories of Judge Abe, and emphasized his commitment to do something to help someone every day. "Do a Mitzvah every day." was his message. A poem that the Judge quoted often, titled At Day's End, illustrated this commitment. What makes this event special is that it not only honors the effort of individual volunteers as tutors/mentors in programs like Midtown Educational Foundation and Inspired Youth, but it recognizes the efforts of volunteers who sit on boards and who help raise money to fund tutor/mentor programs throughout the city and suburbs. The law firm of DLA Piper US LLP was recognized as "Law Firm Program of the Year" because of how it encourages so many of its attorneys to get involved with programs throughout the city, not just one or two high profile programs. When Karen Wallace received her "Making a Difference Award" she quoted from W.E.B DuBois, who said "the right to learn is our most fundamental civil right". You can read that quote here, as part of a longer article about changes that need to take place in public education if pool and minority students in high poverty neighborhoods of all big cities are to have this right. Judge Abe said, "Do a Mitzvah every day." I hope that anyone who reads this will find a way to share this message in their own actions, becoming personally involved, and enlisting others to get involved. If you use your own communications tools -- a blog, a company newsletter, public presentations, etc. --- more people will spend time over the next four weeks searching out volunteer, leadership and donor opportunities in Chicago area tutor/mentor programs as school is beginning to start for the 2007-08 school year. 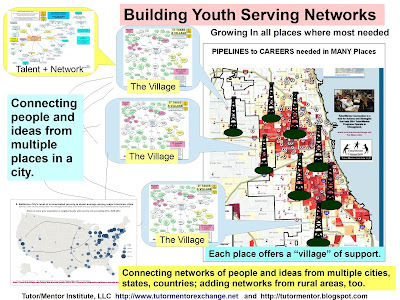 The result will be that more youth are on this path to learning and careers, and more lawyers, doctors, engineers, and other business sectors are working to build the infrastructure needed to support volunteer opportunities in constantly improving tutor/mentor programs, in Chicago, and in every other city of the country. If you can't attend, contribute to the planning, and the public visibility, by participating in on-line forums. Read Nicole White's blog and you'll find Links to on-line forums in MySpace, FaceBook, and at Ning.com. Nicole is a 2007 Northwestern University graduate, who is serving a one year Public Interest Program Fellowship with Cabrini Connections, Tutor/Mentor Connection. Read about the goals of the recruitment campaign. I encourage you to read the article posted on the Smart Communities blog today. It says "We have big problems in this country and we need the free and creative thinking of foundations, government, and non-profits to help shape solutions." Read more. Today's Chicago SunTimes has a story of how the Nike corporation has reached a $7.6 million settlement to a class action lawsuit that accused Nike of racial discrimination in the way they treated customers and promoted minority employees. It also has a front page story and several inside articles and editorials about the Rev. Al Sharpton coming to Chicago. On the Opinion page the editorial writers offer a "To Do" list of societal problems that Sharpton should address. These include a) school funding, b) gun violence, c) absentee fathers. My wish list goes like this: Sharpton targets businesses like Nike who make a profit by selling products to minority youth, and motivates them to develop leadership strategies that encourage employees and customers to be volunteers, donors and leaders in volunteer based non-school tutor/mentor programs located in the Chicago region. Rev. Sharpton and Nike can both use the Tutor/Mentor Program Locator, and Chicago Program Links to determine what tutor/mentor programs are operating in Chicago. In their news interviews, speeches and advertising, all they need to do is encourage listeners to use these internet resources to shop for where they get involved. Oh, there's one more thing they can do. Most class action lawsuits have money left over. Maybe Rev. Sharpton could encourage Nike lawyers to award that money to the Tutor/Mentor Connection so that we can continue to maintain that database of Chicago programs so that it stays a resource that anyone in Chicago can use to help find a tutor/mentor program, or to help new programs form in areas where none exist.